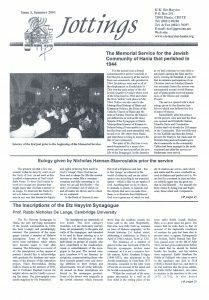 Etz Hayyim serves also as a research and resource centre. Research into the long history of Jews on Crete is conducted at the Evlagon Institute for Cretan Jewish Studies, named after the last chief Rabbi of Crete, Avraham Evlagon. 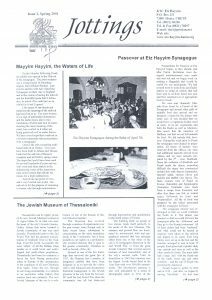 The institute coordinates research projects, publishes research results and develops materials for the synagogue’s educational outreach project and exhibitions. 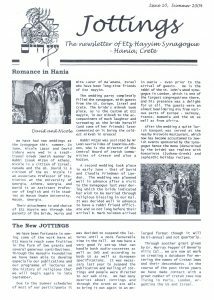 An ongoing project is conducted in cooperation with two Greek historians about the social history of the Jewish Community of Hania in the 19th and 20th century. 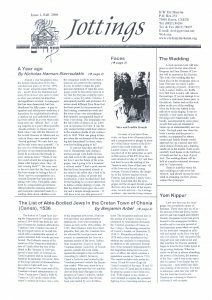 Archival holdings on Cretan Jewish history are being systematically expanded. 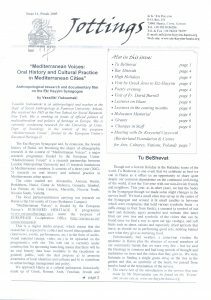 There is also an extensive reference collection on a wide range of subjects concerning Judaism, Cretan Jewish history, the Jews of Greece and the Mediterranean, the history of European Jewry and the Holocaust, among others. 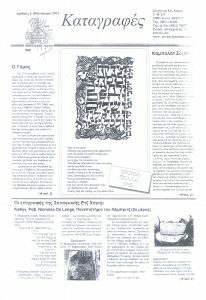 In cooperation with the library at the University of Crete in Rethymnon, the catalogue of Etz Hayyim’s extensive library collection is being included in the university library’s online catalogue. The library and archive are open and accessible to the public and scholars. Small Greek-Jewish communities have rarely found their way into modern historical studies. 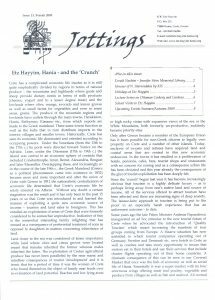 With the exception of Salonica, the biggest Jewish community in the Greek state, the rest, which in fact are numerous, have not yet become the object of an in-depth historical analysis. Jewish Crete is such a case. If the circumstances of the destruction of the Cretan communities, which perished in the Tanais shipwreck in June 1944, have been reconstructed to a significant extent, our knowledge regarding these communities in the preceding years remains rather fragmented and sporadic. 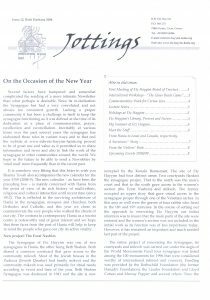 The on-going project ”Reconstructing an absence, Narrating a presence: the Jews of Hania, Crete” wishes to fill this gap. It focuses on the Jews of Hania, the largest Jewish community on Crete in the 20th century, and seeks to reconstruct the community’s life in the troubled decades before the war. 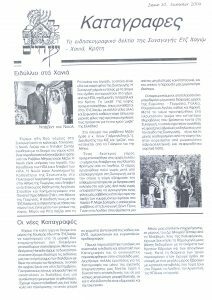 The project, which is supported by the Germanacos Foundation and conducted under the aegis of Etz Hayyim Synagogue of Hania, Crete is directed by Vassiliki Yiakoumaki, Assistant Professor of Social Anthropology at the University of Thessaly, Greece. The project’s researchers are Daphne Lappa, Postdoctoral History Researcher at the University of Crete, and Katerina Anagnostaki, PhD Candidate of History at the University of Crete. The current research intends also to be an invitation to descendants of the Jewish-Cretan families to approach the Synagogue and seek information on their ancestors. 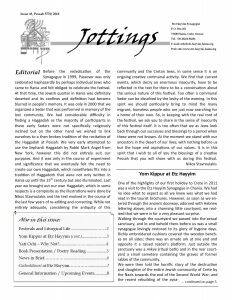 If you would like to learn more about your families, please fill in the questionnaire in the link below and mail it to the Etz Hayyim Synagoge or to the researchers.  In case you do not wish to fill in the questionnaire, mail the Etz Hayyim or the researchers, giving data about your family that will help us locate it among the family histories that we are now reconstructing. 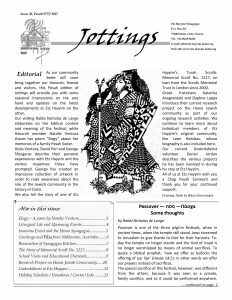 Leon Betsikas was born on 3 March 1917 in Hania and he lived with his parents (Raphael and Perla) and his four sisters (Hrysoula, Anna, Sterina und Sara) near the Etz Hayyim Synagogue in the old town of Hania. Even before the whole Jewish community of Hania was arrested and deported in June 1944, the Betsikas family and their relatives, the Trevezas family, saved themselves to Athens. However, in early April 1944 Leon was arrested because he was Jewish and was deported to Auschwitz/Oświęcim, where he arrived on 18 April 1944. From there he was eventually brought to Mauthausen on 25 January 1945. 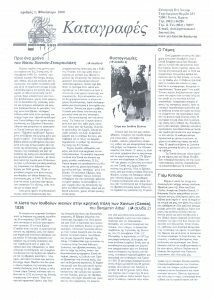 Leon Betsikas died on 24 April 1945 in Ebensee, a subcamp of Mauthausen, less than two weeks before the liberation by US-American troops. 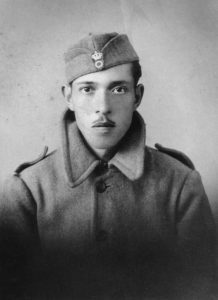 Among his surviving family members his death is remembered as having been caused by him eating a large amount of food which his starved stomach could not digest – a cause of death for numerous concentration camp inmates at the time of liberation. The files of Mauthausen concentration camp, on the other hand, list Leon Betsikas’ date of death before the liberation. This would make it rather unlikely that he receive that much food at the time and therefore the circumstances of his death might have to be further investigated. Currently, our library holds about 4,500 volumes not only on Jewish history with a particular focus on Greece but also on general Jewish history and Judaism, Christianity and Islam as well as on Jewish, Byzantine, Ottoman and European art history and European and world history in general as well as several standard lexica and dictionaries. An online catalogue of the library holdings will be available shortly. The library functions as a reference library and provides several work spaces and a comfortable reading area. It is open to the public on Tuesdays and Fridays 10 am to 5 pm as well as by appointment. Please contact the Synagogue to arrange your visit. The library also houses the Evlagon Institute for Cretan Jewish History, which – as a resource and research center – aims to document and further elucidate the almost 2,500 year long Jewish history on the island of Crete. The library also functions as a venue for lectures, readings and other cultural events, e.g. the meeting of a local poetry group. The library of Etz Hayyim Synagogue evolved from the personal library of Nikos (Nicholaos) Stavroulakis. 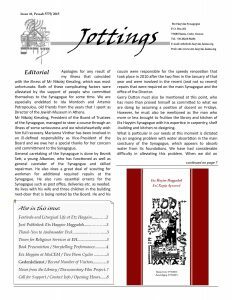 In its original form it was made up of books and off-prints of articles and monographs concerning the Jews in the western Ottoman Empire: either Romaniote or Sephardi. Of special and parallel importance were books concerning Christianity and Islam as well as a considerable number of books on Byzantine and Ottoman art and architecture. 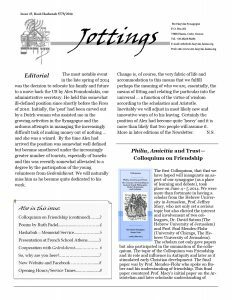 The collection also includes monographs on general Jewish history and also many volumes on related subjects such as theology, mysticism, and political identity as well as a collection of some 250 CDs of music – liturgical and secular – of both the Romaniote and Sephardi traditions. 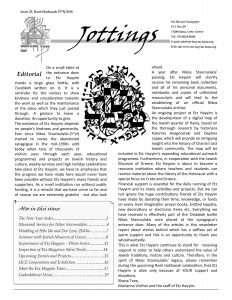 Great care was taken at its re-location in the synagogue proper after 2000 that budgetary concerns were determined by the importance of the library and insuring that new publications be added to it and private donors guaranteed that the library grew. Of special concern were books concerning Greece in general and Crete in particular as well as Israel and Zionism and the Shoah. Unfortunately, a great number of these books etc. were destroyed or rendered unusable due to the two arson attacks of 2010 during which we also lost the archive of the Synagogue which contained documentation of the renovation as well as some original documents of the former community. We were offered the premises of the archaeological authorities in Hania through the assistance of its director Michael Andreanakis and numerous damaged books were restored by specialized staff. We had an enormous response from all over the world to assist in the work of restoring the library. 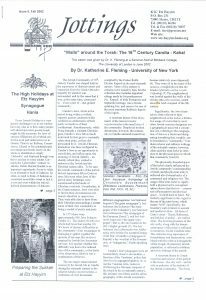 From Israel and New York offers of Sephardi prayer books as well as religious texts were made. The Yiddish Book Center also circulated our list of lost and damaged books; as a result we received book donation from across the US. We were particularly fortunate in receiving more than 800 books from Mrs Judy Hetzler Humphrey of Manassa, Virginia. Those books not only replaced what we had lost but expanded our library in other directions e.g. Africa and African Art. 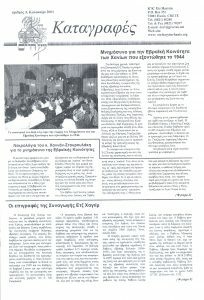 Over the course of several months in early 2016, the staff at Etz Hayyim prepared an exhibition about Nikos Stavroulakis and his rebuilding of the synagogue entitled “20 Year Commemoration of the Reconstruction 1996 – 1999”. The exhibition marks the 20th anniversary of the beginning of the synagogue’s reconstruction and was officially opened on 14th June in the exhibition space above the administrative office. The staff felt it important to honour Nikos’ initiative by presenting nine individual panels that highlight the step by step process of the rebuilding project, but told in Nikos’ own words and with personal quotes and photographs to accompany the text. 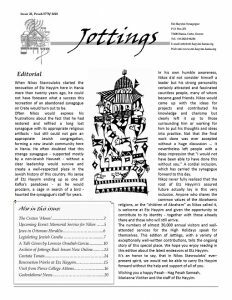 This narrative is routinely explained by staff to Etz Hayyim visitors because the story of the synagogue’s reconstruction and of Nikos are mutually intertwined. Yet, the exhibition has allowed visitors to fully appreciate Nikos’ work in reconstructing the building, as well as his lasting vision for Etz Hayyim as an all-inclusive place of prayer, recollection and reconciliation, with the use of carefully selected photos showing the ruined and abandoned synagogue as it stood for fifty years from 1944 to the mid-1990s. 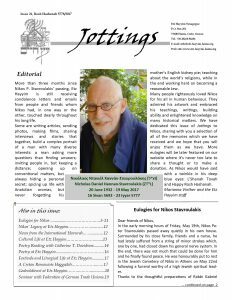 The exhibition begins with background information on Nikos as an academic, art historian, writer, painter and printer and describes how he came to be associated with Etz Hayyim. 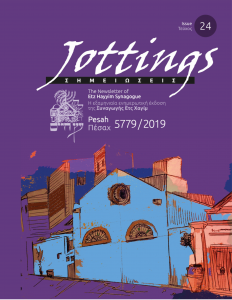 It touches on the events that led to Nikos’ involvement in rebuilding the synagogue fifty years after WWII and the deportation of Chania’s Jewish community, and immediately following a devastating earthquake in 1995 that caused serious structural damage. 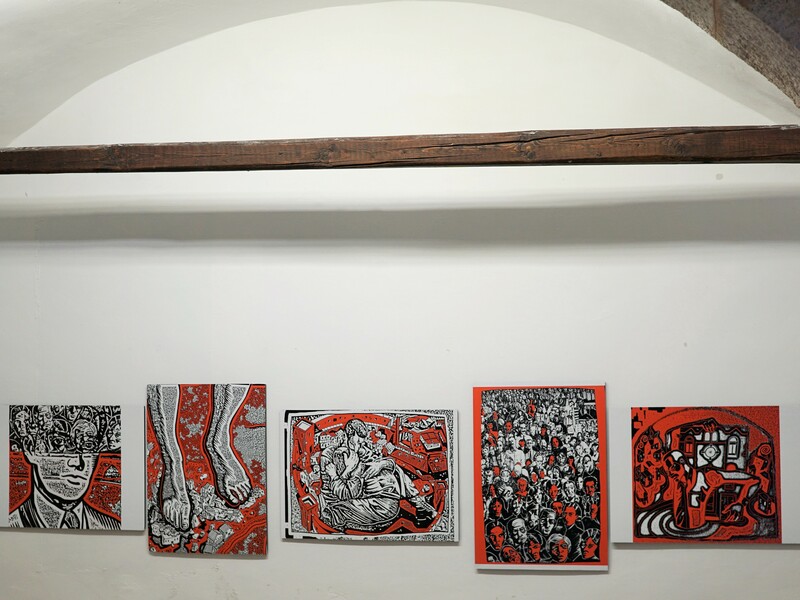 The exhibition details the history of the building from its origins as a Venetian Catholic church in the 15th century and how it came to be a synagogue in the 17th century. The panels then extrapolate each stage of the reconstruction process, beginning with the southern courtyard and mikveh, the northern courtyard and the synagogue interior, itself. 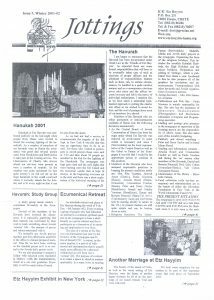 This is followed by a panel about the rededication and reopening of Etz Hayyim in October 10th, 1999 that was attended by the rabbis and presidents of several Jewish communities in Greece, both international and Greek dignitaries including a former Greek Prime Minister, the then German Ambassador and the Metropolitan Bishop of Chania, together with members of the Havurah, local officials and press and other interested parties. 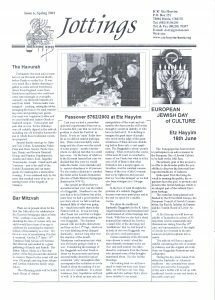 The exhibition ends with a view on Etz Hayyim today; specifically how it runs on a daily basis including the various Jewish holidays, as well as the Hashkavah (memorial service for the Cretan Jewish community), the cultural events routinely taking place, its educational outreach program, and lastly, a section on Etz Hayyim’s dedicated staff and volunteers, the Havurah and the ways in which the synagogue is maintained by a non-for-profit organisation. The exhibition is open to the public during the opening hours of the synagogue. 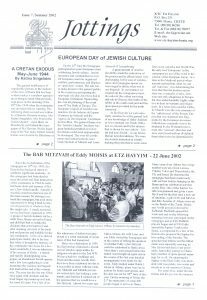 In early Spring 2017, Etz Hayyim received an email from Cretan artist George Sfougaras explaining that after a visit to the synagogue, and with the realisation that as a child he was told very little about the history or even presence of the Cretan Jewish community, he had created “a small book as a personal response to the Jewish community and their plight” and that he “would be very grateful if you could let me know what you think”. 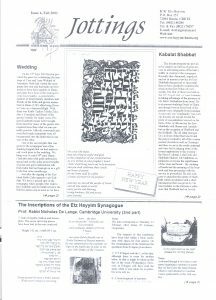 Soon afterwards, we received an electronic version of the book just in time that Nikos Stavroulakis (זצ״ל) whose work, particularly at Etz Hayyim, had made such an impression on George during his earlier visit, was still able to view the artwork and provide the feedback that George had so kindly requested. Nikos fully shared the idea that the history of the Cretan Jewish community had been largely overlooked and was thus appreciative of George’s approach and the execution of his project. 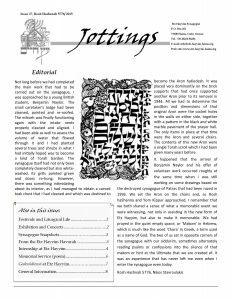 Nikos also suggested that the artwork should one day be displayed at Etz Hayyim. 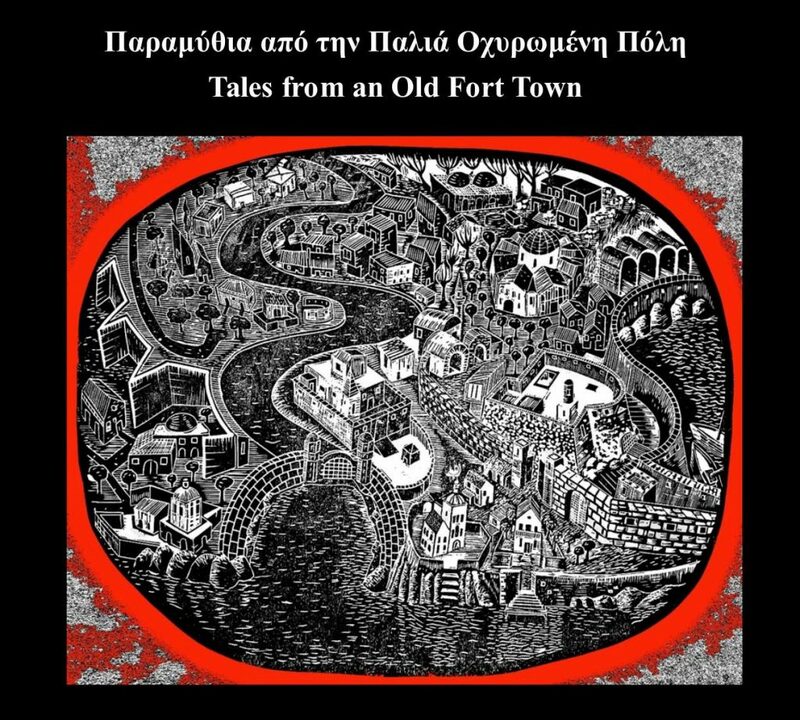 Tales from an Old Fort Town, a title referring to George Sfougaras’ birthplace of Heraklion in Crete, expresses a sensitivity to the richness of the island’s long and complex history, as well as the integral role that Crete’s Jewish community and other neglected communities played in that history. The artist shows that the irreversible loss of the Cretan Jewish community in World War II was not just a terrible tragedy for the members of that community, but also a major loss for Crete and the Cretans, themselves, who have perhaps increasingly lost touch with the complexity and richness of the island’s past. 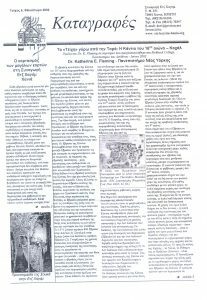 We at Etz Hayyim are confident that George’s artwork will add a valuable and much-needed dimension to the general understanding of Cretan history. 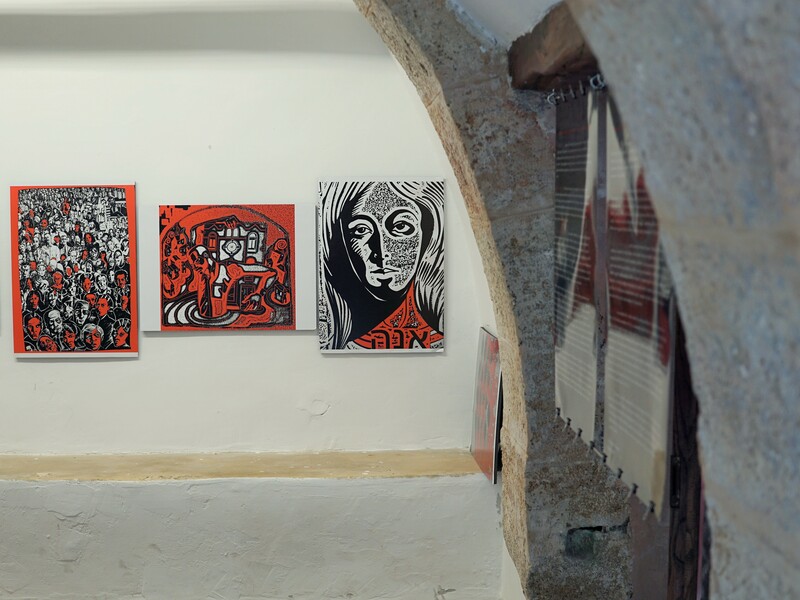 The exhibition is accompanied by a book which the artist describes as “my personal response to the history of the Jewish community of Crete, a community which played an important part in the life of the island but which, through ignorance, racism and religious intolerance, has now disappeared. The community had almost been eliminated entirely and so I had to search long and hard to find its few remaining traces. My motivation for creating this book lies in the belief that the Cretan Jewish community is remembered, while the hatred that destroyed the community is recognized and addressed, accordingly. The book stands as a brief personal tribute, as an echo of a Greek community that is no more and as a work of love for the island of my birth. 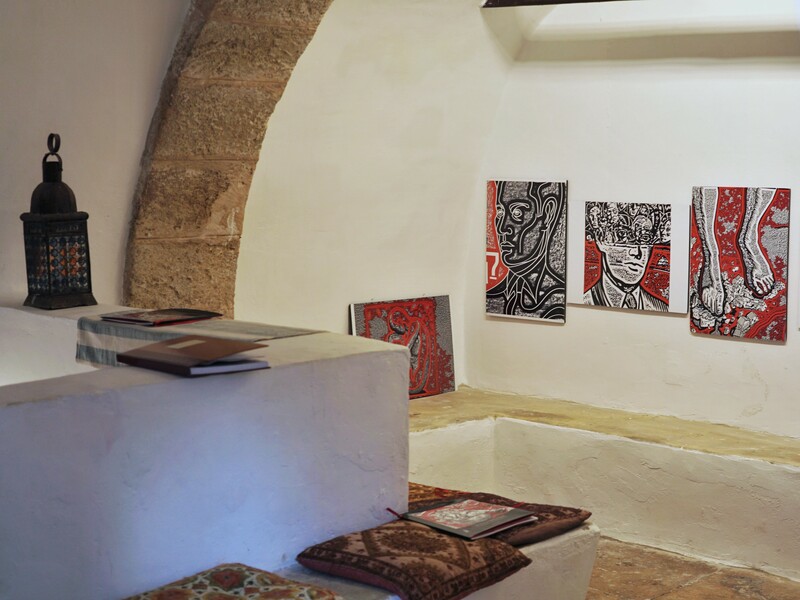 All of the illustrations were originally completed as monochrome pen and ink designs for screen prints and are an essential component of my on-going work into the many histories of Crete”. 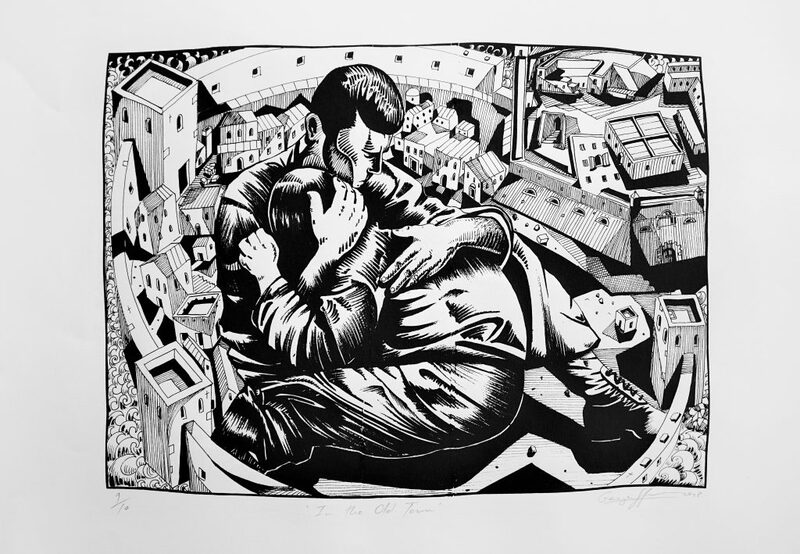 In his book, George’s artwork is enhanced by the evocative poems of Shelly Tracey, a South African poet with Latvian and Lithuanian Jewish roots. For Shelly, her poems serve as an addendum to George’s response to the disappeared Jewish population of Crete. 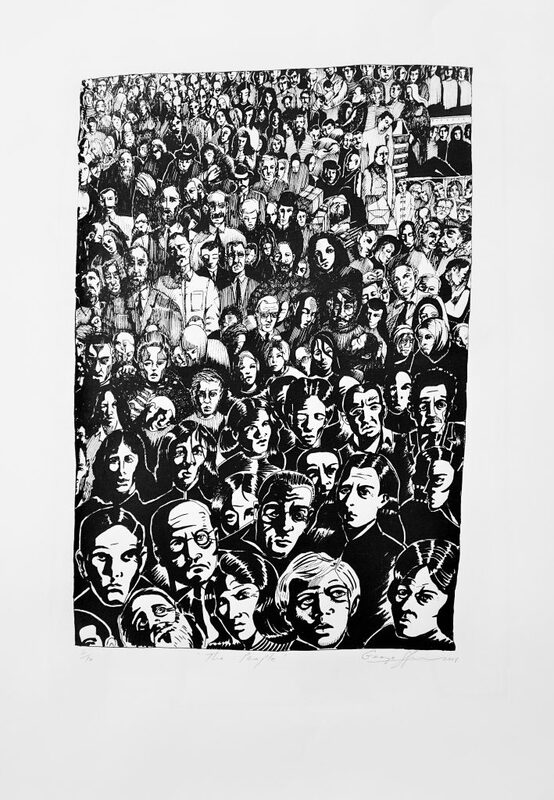 For the poet, “George has captured a sense of loss in his powerful prints and in his account of why he decided to create this project. My poems are influenced by the experiences of the Jews who were forced to leave Crete and also by George’s evocative images”. Την άνοιξη του 2017 έφτασε στην Συναγωγή Ετζ Χαγίμ ένα μέιλ από τον Κρητικό καλλιτέχνη Γιώργο Σφουγγάρα. 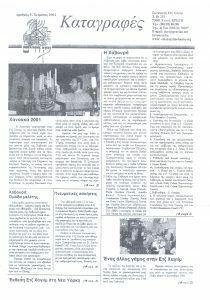 Εκεί εξηγούσε ότι, μετά την επίσκεψή του στην Συναγωγή, είχε συνειδητοποιήσει πως, ως παιδί που μεγάλωσε στην Κρήτη, είχε ακούσει ελάχιστα για την παρουσία και την ιστορία των Εβραίων του νησιού. Αυτή η εμπειρία τον οδήγησε να δημιουργήσει «ένα μικρό βιβλίο, προσωπική απόκριση στην εβραϊκή κοινότητα και τον χαμό της» και να δηλώσει «πολύ ευγνώμων αν μου λέγατε τι νομίζετε» γι’ αυτό. 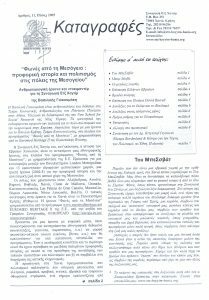 Ο Νίκος Σταυρουλάκης (זצ״ל) ήταν τότε ακόμη σε θέση να ανταποκριθεί στο ευγενικό αίτημα του Γιώργου Σφουγγάρα και να δώσει την άποψή του. Η δουλειά του Νίκου, ιδιαίτερα αυτή που σχετιζόταν με την Ετζ Χαγίμ, είχε κάνει ήδη εντύπωση στον καλλιτέχνη. Η απάντησή του Νίκου δε, ήταν σύμφωνη με την προσέγγιση του βιβλίου, ότι η ιστορία των Κρητικών Εβραίων είναι παραμελημένη. Ο Νίκος εκτίμησε δεόντως τα έργα και την ιδέα πίσω απ’ αυτά και εξέφρασε την επιθυμία κάποια μέρα να οργανωθεί η έκθεσή τους στην Ετζ Χαγίμ. Παραμύθια από την Παλιά Οχυρωμένη Πόλη είναι, λοιπόν, ο ευαίσθητος τίτλος του έργου του Γιώργου Σφουγγάρα και αναφέρεται στην γενέτειρά του, το Ηράκλειο. Παραπέμπει στην μακρά και πλούσια ιστορία του νησιού και στον ρόλο που έπαιξαν σε αυτήν παραμελημένοι σήμερα πληθυσμοί, όπως ο κρητοεβραϊκός. Ο καλλιτέχνης υποστηρίζει ότι η απώλεια της εβραϊκής κοινότητας της Κρήτης στον Β΄ Παγκόσμιο Πόλεμο δεν ήταν μία τραγωδία μόνο για τα ίδια τα μέλη της, αλλά και μία τεράστια απώλεια για την Κρήτη και τους υπόλοιπους Κρητικούς που ίσως να έχουν κιόλας χάσει την σύνδεσή τους με το πλούσιο και περίπλοκο παρελθόν του νησιού. Στην Ετζ Χαγίμ πιστεύουμε ότι το έργο του Γιώργου θα αναδείξει μία απαραίτητη διάσταση στην γενική κατανόηση της ιστορίας του νησιού. Η έκθεση συνοδεύεται από έναν μικρό τόμο, που ο καλλιτέχνης περιγράφει ως την «προσωπική μου απάντηση στην ιστορία της εβραϊκής κοινότητας της Κρήτης, μίας κοινότητας που έπαιξε σημαντικό ρόλο στην ζωή του νησιού, αλλά η οποία, λόγω της άγνοιας, του ρατσισμού και των θρησκευτικών προκαταλήψεων, έχει τώρα εξαφανιστεί. Η κοινότητα είχε απαλειφτεί εντελώς κι έτσι έπρεπε να αναζητήσω επίμονα τα λίγα εναπομείναντα σημάδια της. Το κίνητρό μου γι’ αυτό το βιβλίο είναι η πεποίθηση ότι οι Κρητικοί Εβραίοι δεν έχουν ξεχαστεί και το μίσος που τους κατέστρεψε έχει εντοπιστεί και κατακριθεί. Το βιβλίο είναι σαν η ηχώ μίας ελληνικής κοινότητας που δεν υπάρχει πια και είναι και ένα έργο αγάπης για το νησί που με γέννησε. Όλα τα έργα έχουν δουλευτεί με μαύρο μελάνι και αποτελούν ζωτικό μέρος της δουλειάς μου για τις πολλές ιστορίες της Κρήτης, μίας δουλειάς σε εξέλιξη». Στον μικρό τόμο τα έργα του Γιώργου συνοδεύονται από τα ποιήματα της Shelley Tracey, ποιήτριας από την Νότιο Αφρική με εβραϊκές ρίζες από την Λετονία και την Λιθουανία. Για την Shelley τα ποιήματά της αποτελούν συμπλήρωμα στο έργο του καλλιτέχνη. Σύμφωνα με την ίδια «ο Γιώργος έχει απαθανατίσει την αίσθηση της απώλειας στις τόσο δυνατές εικόνες του και στην αφήγησή του για το πώς αποφάσισε να ασχοληθεί με αυτό το έργο. Στα δικά μου ποιήματα επηρεάστηκα τόσο από τις εμπειρίες των Εβραίων που αναγκάστηκαν να αφήσουν την Κρήτη, όσο και από τις εικόνες που δημιούργησε ο Γιώργος».